Calling all Lifts 3'' or less!! 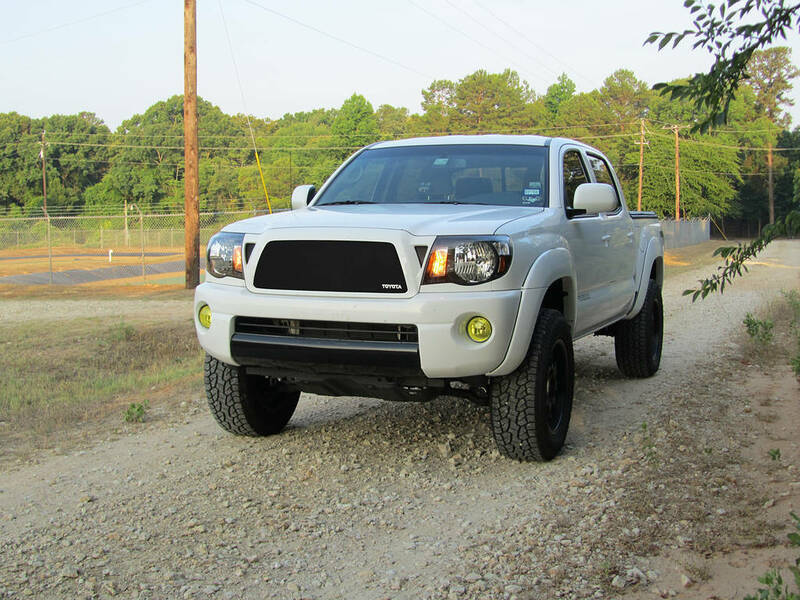 Discussion in '2nd Gen. Tacomas (2005-2015)' started by goaggies2011, Sep 26, 2010. I'm getting new wheel/tires, and am looking into a minor lift to give it a great look. Like anybody else I'm looking into something affordable and safe, around 3'' or less. If you've done a 3'' or less lift on your truck an love how it looks/handles, can I get a review of what you've got? OME 3" lift with 885 coils. OME Shocks with TSB 1.5 AAL. 285/75/16 KM2s. XD Hoss 16" wheels. DDM Tuning 6000K HIDs, H10 6000K Fogs. BHLM. Debaged. 20% tint on front windows. Search around dood, the site has plenty of them. Billstein 5100's on all corners. The fronts set to 2.5" with stock springs. 1.5" Wheelers AAL in the back. SAWs 2.0s at 2" of lift in the front, Wheeler's 3-leaf AAL, 255/85/16 Cooper S/T on stock rims. The ride is alot better than stock. skistoy Make mine a Double! Tint, tinted tails + 3rd brake light, shaved tailgate, painted calipers. TSB Leafs+ AAL, PA/CB, 5100 Bilsteins set @ 2.5 up front. Satoshi line-x'd grill. ill put pics up at a later time.. but i have 5100 up front at 2.5. TSB in rear (AAL soon) 285/70/17 wrangler mt/r and spacers up front on stock 17" sport rims. (rear spacers to come) i barely rub up front on the black plastic that hangs down. soon to be cut off. King 2.5" extended travel coilovers with compression adjusters, Camburg UCA's, King 2.5" rear shocks, TRD 1st gen CAI. 2.5" AutoSpring strut spacers in front, no negative change in the ride up front. Firestone airbags in the rear, slightly stiffer ride but I need the adjustability and besides this is a truck. I run 285/70/17 Dueler's, only a very very slight tire rub on the upper control arm at full lock, I might change the arms out one of theses days, but I would have to be pretty bored that day. Overall I'm very happy with the way it looks, rides and how well the airbags perform. Don't whine, little dude, Contribute! Thanks for the input ya'll, and I know I could spend a day searching the forums for trucks with lifts. I like doing other things, and I figured people wouldn't mind bragging on how bad A their build is. 2.5" Spacer on top of coil and TSB rear with 1" block... 265/75/16 tires. Ride is very FIRM but handles good. I am NOT a heavy off-road person, beaches and back roads are my playgrounds when I go. 6" Fabtech coilover lift. 35/12.50/17 Mickey Thompson MTZ, 17x9 ProComp 1089 wheels painted black, UWS black lowprofile toolbox, husky liners, tacoma bed mat, bed lights, Premier stereo, Cobra 19 cb, firestik 3' antenna. Bilstein 5100s at 2.5 with rear TSB. 265/75/16 Goodyear Wrangler Authority All-Terrains. Here you go, Bilstein 5100's at 1.75" up front. Rear spring TSB in the rear. 265/65/18's.